What is the Value of Propeller Balancing? We all want to enjoy a smooth, comfortable flying experience. But all too often, excess and unwanted vibration can make flying downright unpleasant for pilots and passengers. Not only is vibration noisy and disruptive, but it can also cause extensive damage that drives up maintenance costs. Excess vibration may put stress on just about every part of an aircraft, including the airframe, engine accessories, and even the avionics equipment. Even if you don’t feel or hear vibration while flying, your aircraft propeller could still be out of balance. Check for wear and tear around the propeller assembly, including cracks in the spinner dome, loose rivets, or cracks in the aircraft cowling. If you notice any of these signs, it’s time to have a professional maintenance technician take a look. It’s important to note the difference between static and dynamic propeller balancing. All propellers come from the factory statically balanced. A static balance is also routinely performed during overhaul services. Statically balancing a prop ensures that one blade doesn’t weigh more than another. But once it is mounted and installed on the aircraft, even a well-balanced prop can become offset. In addition to static balancing, most propellers benefit from dynamic balancing. Dynamic balancing is the process of measuring the vibration of the entire propeller and engine assembly while it is in operation. To do this, accelerometer sensors are attached to the engine, and then the aircraft is started and brought to full power. The sensors analyze the vibration magnitude of the propeller and engine in inches per second. A small optical tachometer is also used to measure the RPM of the engine and the movement of the propeller. 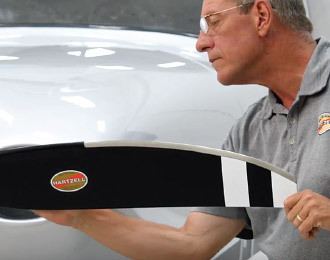 This allows propeller technicians to identify the angle at which the imbalance exists so they can add a small amount of weight to correct the imbalance. The test is repeated until the level of vibration is found acceptable by the technician. Ideally, the process of dynamic balancing will reduce vibration to within 0.07 inches per second. Overall, dynamic balancing is a smart move to protect the health and longevity of your aircraft propeller, engine, airframe, and avionics. It can also give you and your passengers a smoother, more comfortable flight. After a dynamic propeller balance, many pilots say they feel as if they are flying a completely different airplane. The best time to have your propeller dynamically balanced is after an overhaul or propeller replacement. Any time your prop is removed, it’s a good idea to have it rebalanced. But keep in mind, not all prop shops have the specialized equipment, tools or training needed to perform quality dynamic balancing. Be sure to do your research before choosing a shop to service your propeller. At Hartzell, we’ve assembled a global network of Recommended Service Facilities (RSF) that have met our high standards for quality and safety. To find your nearest RSF, click here.